I’m finding it quite hard to bring you a thought for the week without showing you a rap track. So much in hip-hop is about story telling and putting a concept, idea or emotion across to the listener so some can be topical, others very specific to an event. This, however, is not hip-hop. This is Carl Sagan. Yes that’s right, the astrophysicist/cosmologist. The scientist. The legend. Not the musician. This isn’t a song though, this is more of an inspirational speech over chords. It works though. His way with words and the way he says them truly are inspiring. Apparently one of his biggest worries was that as humans create more advanced technology we will self destruct and wipe out our whole race (just googled this and apparently there’s some science to it, google, YouTube and wikipedia mention the ‘Ferni Paradox’ and the Drake Equation. I don’t know what that means. ), so he spent a great deal of time trying to get the message across of different ways we could destroy ourselves as a species. The video I’ve chosen here is an animation a college student made as their final project. There are other video montages using actual footage rather than animations, but this was the first one I’ve found, so here you are. 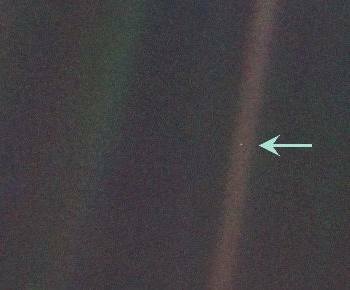 The actual photo Carl Sagan’s team took of Earth from near Saturn by Voyager is just like it’s described, the Earth is shown to just be a pale dot in the middle of nothingness and that image can be seen here and here. 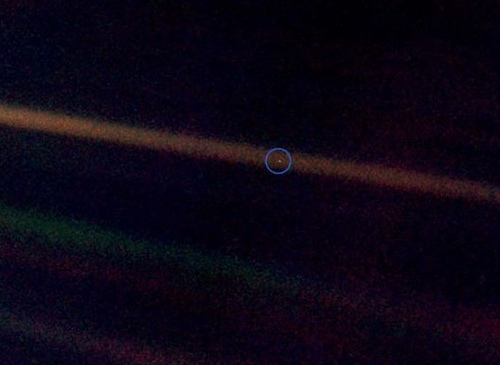 For a point of reference, The photo is taken roughly 4 billion miles away from Earth. I listen to this every now and again to put things in perspective. Humans haven’t evolved to be able to comprehend the vast size and nature of the Universe, but it’s fun to try when I have some time to kill. This also highlights how tedious and petty religious/political wars are when compared to how significant we actually are on the scale of the universe. I suppose I could appreciate it more if I was high, but I already find it mind blowing. If somebody listens to this and doesn’t get a strange feeling, please let me know. I know there is an LP of Carl Sagan’s ‘The Music Of The Cosmos’ as Nardwuar the Human Serviette gave it as a gift to N.E.R.D in an interview which can be seen here (this interview is so fun, watching Pharrell get his mind blown by the interviewer), so that is one album I need to hear. I hope you can reflect on this and enjoy it, have a good week, friends!